Russia is twice as large as the next-largest country even after shedding 14 smaller countries from its periphery. Russia is the largest country in Europe and Asia even without counting the parts on the other continent. Russia spans nine time zones. It’s difficult to imagine, but Russia spent a great deal of its early history as “the empire without a coastline.” The original, ancestral homeland of the people who would become the Russians is the general vicinity of Moscow. While the East Slavs were still coalescing as a people, they bordered the West Slavs on the west, the Karelians and other Finno-Ugric peoples to the north, the Khanate of Kazan to the east, and the Nogai Horde to the south. To reach a coastline and the massive economic advantages that come with access to the sea, the Russians had to conquer their way there. And conquer they did, until they dominated much of the Arctic Ocean, Baltic Sea, and Black Sea boundaries and all of the peoples living therein. Russia is smaller now, but its enormous expanse still contains numerous groups of people who do not see themselves as Russians and which the Russian state is assiduously trying to destroy. We have already met the Caucasus peoples and their finely granulated quests for national self-determination. Russia’s imperial designs have spanned much farther than these ongoing altercations, and tell a very familiar story. Between 1500 and 1900, Russia grew from a fractious inland territory into the behemoth Russian Empire. Expansion began under Ivan the Terrible, who first proclaimed the Tsardom of Russia out of the Kievan Rus and the Novgorod Republic. This was the beginning of the coalescence of the East Slavs as a distinct group and the end of Mongol and Tatar control over the incipient Russians. The new Russian state’s path to the sea began with the absorption of the Finno-Ugric peoples to Russia’s north, in particular the Karelians on Finland’s border. Their inclusion in Russia would form the core of an ongoing feud with Finland, and remains a sore point in relations between the two countries. The ports acquired in this way eventually formed a key part of Russia’s economy. Next, Russia defeated and annexed several small khanates, successors of the Mongol Golden Horde. By adding Kazan in 1552, Astrakhan in 1556, Sibir in 1598, and Kalmykia in the mid-1600s, Russia gained control over virtually the whole of the Volga River and its first entry into to Siberia and Central Asia. It also added substantial populations of Mongol, Finno-Ugric, and Turkic peoples to the population under its nominal control, peoples who were not Russian and were, at most, impressed with the power that the young Russian state had demonstrated against their previous Mongol and Tatar leaders. After these conquests, Russian eastward expansion was staggeringly rapid. With a stated purpose of expanding the fur trade, Russian explorers crossed the Ural Mountains. Russia gained control over the rest of Siberia by building forts along the Ob, Yenisei, Lena, and Amur Rivers and by signing treaties with China, establishing Russia’s southern border and bringing its eastern edge to the Pacific by 1640. The forts made Russian dominion over the most important parts of the region a fait accompli even without military victories, opened the natural resources of Siberia to exploration and extraction by Russian companies, and brought the small-scale tribal economies of the Siberian peoples into contact with the burgeoning European nation to their west. As it often goes, related (and sometimes identical) groups suddenly had long imperial borders sliced between them by empires that had nothing to do with them, and could do nothing about it. Throughout this process, the Russian cultural mainstream regarded all of these new peoples as inferior and primitive. Much as the European colonists treated the native peoples of the Americas as uncivilized savages, Russians referred to Tatars, Kazakhs, Kalmyks, and other nomadic Asian peoples as savage, crude, cunning, and unclean. Every difference between the indigenous and Russian cultures was taken as a sign of indigenous inferiority. The Russians, like their American and Canadian contemporaries, treated the natives’ nomadism as a reason to deny their claim over their territory. Russia devoted a great deal of energy to developing towns and cities along these river and later railroad paths, and heavily encouraged migration into these lightly-populated regions. Freed serfs in particular found the offers of large tracts of “virgin” land too enticing to ignore. This frontier also served as a convenient dumping ground for prisoners, political dissidents, and others who disturbed the social order within Russia proper. To facilitate these movements, Russian authorities would assign specific lots of the native peoples’ own territory to them as an enticement to assimilate into a sedentary lifestyle and as a pretext for assigning the rest to any Russian settlers who wanted it—Russia’s answer to the reservation system. These people even received a legal classification—inorodtsy, or “other origin”—similar to the legal meaning and effect of terms like First Nations and Indian in North America. The same practices and biases extended into the Caucasus after the Russo-Circassian War of 1763-1864 and the Russo-Turkish and Russo-Persian Wars in 1828. In Russia as in North America, the indigenous peoples of northern and central Asia were pressed into smaller and smaller fractions of their own homelands by the teeming press of colonizing farmers. New settlement regimes crowded the Asiatic peoples onto minuscule parcels on mountainsides and other places totally unsuited to their lifestyle, resulting in social degradation and the slow destruction of the indigenous economy. Soviet-era collectivization and totalitarianism were only more aggressive and powerful forms of the same. The nomadic and pastoral societies of the Turkic indigenous in particular were all but destroyed, pushing thousands of Kazakhs and others into seasonal farm-work, menial labor, and other poverty-confirming employment as they tried to hold on to their culture, perversely confirming Russian stereotypes of inorodtsy as unsuited for “civilized” life. More settled cultures, such as many of the Finno-Ugric peoples further north, received a thematically similar and equally successful regime of Russian political control, influx of Russian settlers, and pressure to abandon indigenous shamanism for Russian Orthodox Christianity. At this greatest extent, Russia encompassed an enormous diversity of peoples even when they were considered in the broadest categories: Baltic, Finno-Ugric, Eastern Romance, Slavic, Turkic, Mongolic, Yeniseian, Tungusic, Iranian, North Caucasian, Kartvelian, Armenian, and Paleo-Siberian. This diversity would grow still further when the Russian hold reached its farthest extent after World War II. At the level of individual ethnic groups, dozens upon dozens found themselves under Russian dominion. The largest and best-defined of these groups would form the core of new internal divisions, in particular those that marked the Union of Soviet Socialist Republics. The Russian Empire was reorganized into a set of nominally independent republics, whose borders shifted with the political wind and were often maintained specifically to prevent ethnic-nationalist sentiments from galvanizing. Most of the old Russian Empire was retained within a single such republic, the Russian Soviet Federative Socialist Republic, where another layer of territorial divisions attempted to keep the Russian identity topmost. Relatedly, the Russian authorities mandated that the Cyrillic script be used for all languages in Russia and promoted Russian as the sole language of government and education. An empire as large and potentially fractious as the Russian Empire, equaled only by the Mongol conquests of old, could not afford the formation of strong local identities. A sufficiently widespread ethnic- or religious-separatists movement would tear the Empire to pieces. Under the assimilationist onslaught, many ethnic groups all but vanished, or were reduced to extremely low numbers. Soviet-era wholesale relocations of various groups into the Kazakh or Siberian wilderness further weakened many ethnic claims and permitted more thorough Russian colonization of their homelands while they were forcibly absent. But in the 1990s, this all came crashing down. The Soviet Union fell, and within a year all 15 of its republics were independent. Ethnic-nationalist movements throughout the former Soviet Union led to the return of millions of Russians to Russia and the (re)establishment of Estonia, Latvia, Lithuania, Ukraine, Moldova, Georgia, Armenia, Azerbaijan, Kazakhstan, Uzbekistan, Kyrgyzstan, Turkmenistan, and Tajikistan as homelands for their eponymous peoples. Most of these still have large Russian minorities and maintain Russian as a co-official language. Other former Soviet states—Belarus, Transnistria, South Ossetia—have more complicated feelings toward their former or current Russian masters. Unfortunately, this ethnic-nationalist disintegration stopped at the edge of the RSFSR, and did nothing to assist the plight of the neglected, partially Russified peoples of the still-unspeakably-huge Russian successor state. Instead, the new Russian Federation has reorganized its internal boundaries once more, with an eye toward standardizing the previously somewhat chaotic relationship between the federal state and its subjects. A program of merging economically “weak” regions with nearby “strong” neighbors has erased some of Russia’s previous indigenous republics and made their people democratically invisible. These imperiled people must now operate from within overwhelmingly Russian krais and oblasts, reduced to single-digit percentages of the population via large-scale gerrymandering and now prevented from having official support of their languages and cultures. And, as always, the onslaught of internal colonization via actively encouraged settlement in areas far from the Russian core continues unabated. But unlike the indigenous peoples of most of the Americas, the Finno-Ugric, Turkic, Caucasian, Mongolic, and Paleo-Siberian peoples remain visible as a substantial portion of Russia’s cultural tapestry, and some of them retain a measure of control over their politics in a way that the Americas’ indigenous people largely do not. In particular, large regions of Russia remain demarcated in the form of indigenous republics, often several in close proximity to one another. The Finno-Ugric peoples are spread thinly across northern Eurasia, from Norway to the Gulf of Ob. Of the dozen or so distinct ethnic groups within this classification, only three have nations of their own: Finland, Estonia, and Hungary. The Sami people straddle the border regions of Norway, Sweden, Finland, and Russia, with various degrees of autonomy in each country. The other Finno-Ugric peoples include Russia’s Nenets, Enets, Khanty, Mansi, Komi, Mordvin, Mari, Udmurt, Karelian, Selkup, and Nganasan, and all of these are tiny minorities of Russia’s population. Many of these groups have indigenous republicswhere their languages are co-official with Russian, but even within these republics they are outnumbered by the resident Russians and often becoming more so. The threat of assimilation, furthered by the loss of official status for many Finno-Ugric languages, has prompted the creation of a World Congress of Finno-Ugric Peoples and other efforts at integration between these various related groups. This organization agitates for the rights and autonomy of the remaining groups with Finnish, Hungarian, and Estonian support. Estonia has also opened its universities and other institutions to Russia’s indigenous peoples, to the same end, as the most recent Finno-Ugric nation to gain independence from Russia. The eventual fate of this subset of Russia’s indigenous people has also gottent the attention of the European Union. The Turkic and Mongol peoples are where Russia’s indigenous relations differ most dramatically from those of the United States. Not only have five Turkic peoples—the Azeris, Kazakhs, Kyrgyz, Turkmen, and Uzbeks—gained independence for their homelands in the past half-century, but five other Turkic and one Mongol-descended people—the Chuvash, Bashkirs, Tatars, Tuvans, Sakha, and Kalmyks—remain majorities in their ethnic republics, or form a plurality alongside another Turkic group. The Tatars, as well, have spread far from Tatarstan, forming distinctive communities throughout Russia and Ukraine. Unlike Russia’s other minorities (and in stark contrast to their Finno-Ugric compatriots), the Turkic peoples of Russia maintain a strong degree of control over their cultural affairs. Even so, many Turkic and Mongol groups are threatened by assimilation, and many are not as lucky as the above ten have been. Buryatia, Khakassia, and Kalmykia are coveted natural resource sites, and the Kalmyks’ society was irreparably damaged by Soviet-era deportation to central Asia. The Turkic republics are some of the fiercest opponents of the changes to Russia’s federal system, and perhaps the most viable (if not the likeliest) candidates for new northern Asian states, particularly in light of their involvement in TÜRKSOY and similar international organizations. Russia is home to several indigenous groups that do not fit under the Finno-Ugric and Altaic umbrellas. In the far eastern region of Chukotka, the Chukchi people are another minority, crowded out like so many others. The Yupik people are kin to the Aleut and Inuit of the North American Arctic, and the Evenks are kin to the Manchus of China. Most enigmatic are the Ket and the Ainu, whose affinities are only slightly clearer than those of the Basques of Spain and France. These people are usually grouped as “paleo-Siberian peoples,” despite the open acknowledgement that they have little in common with one another. Except for the Chukchis, these people are at least as isolated and rare as the most imperiled of North America’s indigenous people, and none of them have language rights in their homelands. In the Evenks’ case, they previously had an autonomous region, but had it merged into Krasnodar Krai with several other groups. Arguably, some of the paleo-Siberian peoples are already lost, including several branches of the Ainu and Ket. Russia is likely not done fragmenting, by its sheer improbable size alone. However, virtually all of Russia’s minorities are densely interwoven into the Russian population, much as the natives of the Americas are deeply entangled in the settler population. Even if the Nenets or Khakas maintain enough societal cohesiveness to persist as distinct peoples into the future, any prospective state for them would include more Russians than indigenous, barring a massive relocation on par with the movements that followed the fall of the Soviet Union. 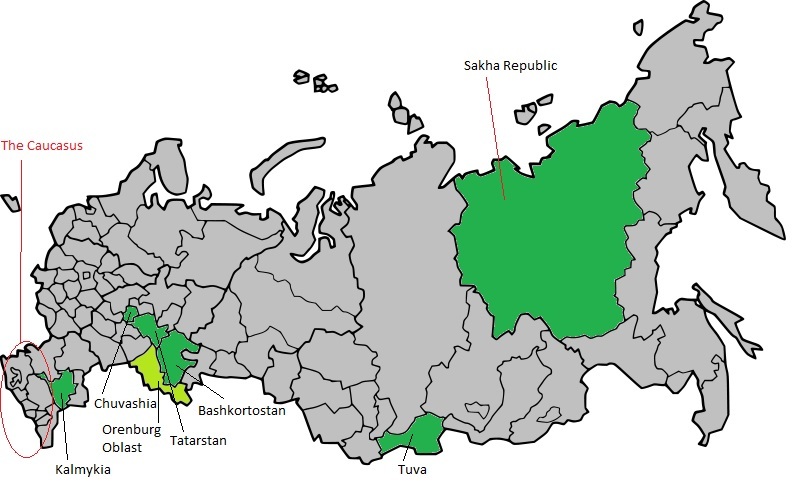 Only six of Russia’s remaining indigenous republics outside the Caucasus are majority indigenous: Kalmykia, the Sakha Republic, Tuva, Chuvashia, Bashkortostan, and Tatarstan. Of these, only the Sakha Republic has an oceanic coastline, and the Sakha people may find themselves in a position to declare independence (with support from the Evenk minority and the other former Soviet states) if the Arctic Ocean becomes a more important maritime route or source of natural resources. The Tuva Republic has enough cultural similarities with neighboring Mongolia that a merger may appeal to the Tuvans—or perhaps independence is in the future there as well. The other indigenous-majority republics would be completely surrounded by Russia if they gained independence, making it unlikely that they will ever press for or get more than various degrees of internal autonomy. Kalmykia is also still dealing with the consequences of the Kalmyk’s Soviet-era deportation, which damaged the Kalmyk culture and inter-generational language transfer much as similar deportations destroyed many Native American cultures. It’s hard to imagine that the various khanates, which tended to be multiethnic, somewhat decentralized regions under Mongol and Tatar control, would have been much kinder to any ethnic-nationalist aspirations among their subjects. Still, they may not have been as successful as Russia at preventing relatively large or widespread groups, such as the Nenets or Bashkirs, from declaring that they would make their own way in the world. It’s important to remember that Russian dominion was not the start of these peoples’ subjugation to foreign rulers, and similar situations might have appeared even if the Russians had stayed away. If there had been justice in history, the peoples of Buryatia, Altai, and Tuva would have been included in Mongolia, where their ethnic, cultural, and often religious kin reside, rather than Russia. The central Asian Turkic states would include a larger Chuvashia, Tatarstan, and Bashkortostan encompassing part of what is now a Russian-majority belt around these republics. To the southwest, Kalmykia would be the only Buddhist-majority state in Europe. In northeastern Siberia, the Sakha Republic and Chukotka would be independent states for the Sakha and Chukchi people and important voices in Arctic affairs. The Evenks would control another large section of eastern Siberia, possibly closing Russia out of the Pacific and changing the northern border of China. 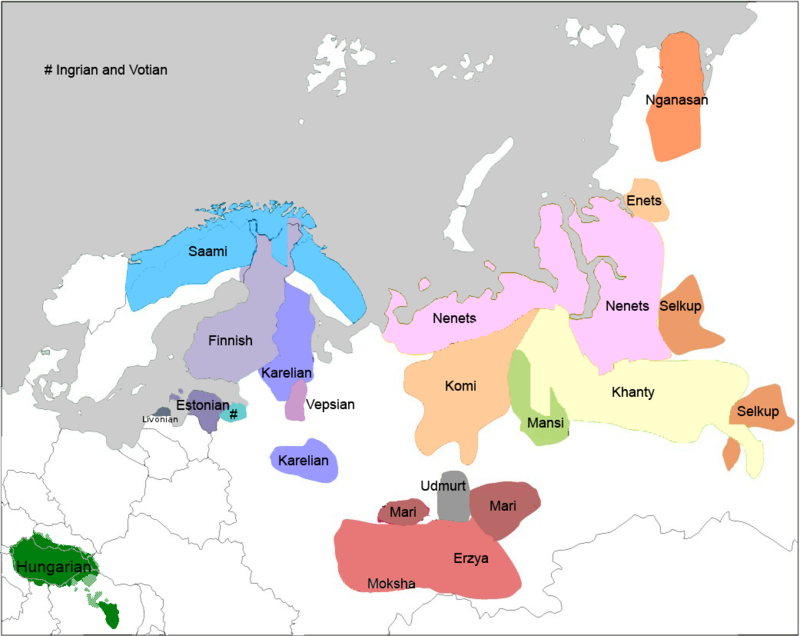 The Finno-Ugric peoples would likewise claim a vast swath of northeastern Europe and the Arctic coast, either divided among themselves or as part of an indigenous federation or empire with its own deeply ironic problem of cultural assimilation and ethnogenesis. Tragically, a more likely outcome in virtually all of these cases is slow assimilation into the evolving, expanding Russian cultural identity, with the accompanying loss of language and perception of uniqueness. What cultural largess is the world losing through Russia’s concerted attack on its indigenous people? What do we stand to gain if Russia gives these restive groups the independence that many of them desire? Now that would be an interesting world. Sources: Sabol, Steve. Spring 2012. “Comparing American and Russian Internal Colonization: The “Touch of Civilisation” on the Sioux and Kazakhs.” The Western Historical Quarterly 43(1):29-51. Waiting for you to do India one day. I touch on Pakistan in the one about the Persosphere, for what it's worth. I will definitely keep them in mind. My focus would likely have been on the cultural and linguistic divide between the northern, eastern, and southern parts of India and on the Dravida Nadu and Tamil Tiger movements, but there's definitely room to explore the divisions in northern India as well.